http://www.stuff.co.nz/entertainment/ce ... in-Bangkok wrote: Actor David Carradine, star of the 1970s TV series Kung Fu who also had a wide-ranging career in the movies, has been found dead in the Thai capital, Bangkok. A spokesman for the US Embassy, Michael Turner, confirmed the death of the 72-year-old actor. He said the embassy was informed by Thai authorities that Carradine died either late Wednesday or early Thursday, but he could not provide further details out of consideration for his family. The newspaper said Carradine could not be contacted after he failed to appear for a meal with the rest of the film crew on Wednesday, and that his body was found by a hotel maid at 10am Thursday morning. The name of the movie was not immediately available. A police officer at Bangkok's Lumpini precinct station would not confirm the identity of the dead man, but said the luxury Swissotel Nai Lert Park hotel had reported that a male guest killed himself there. Yeah I just read that, terrible circumstances, just goes to show that someone with huge success behind them can be so unhappy. It is pretty remarkable how high and low his career went. At one point he was so poor he had to choose between petrol or a phone, so he chose petrol and would spend a couple of hours every day hanging out in the lobby of his agent in the hopes they would let him know he had a job instead of trying to phone him. Just like his father he did some really class stuff, and some amazingly cheap drek. Check out 'Death Race 2000' if you get the chance. It got remade recently, but supposedly for years it was Tom Cruise that was trying to get it remade looking to play the Carradine role. and it was great to see him again in Kill Bill 2 the other night on the telly. i love those movies. Did the 80s kung fu shoes come as a spin off from that program? at the risk of sounding unsympathetic, it is somehow "nice" to read about a suicide without the typical code language used in the report "found dead... no one is being sought..."
Dazzle wrote: It is pretty remarkable how high and low his career went. who will roam the earth like Kaine in Kung Fu now? It warms my belly to see you type that. HURRAH FOR STAR TREK!! Also, back to the tragic death of Mr Carradine, Martha Plimpton (from such movies as "The Goonies") is his daughter. swtchbckr wrote: and it was great to see him again in Kill Bill 2 the other night on the telly. i love those movies. Was reading a Q&A that Tarantino was doing for his upcoming movie. He was asked about sequels and said that the actors for Pulp and Dogs were getting too old to do sequels, but he was still thinking about doing another Bill, and maybe a western. 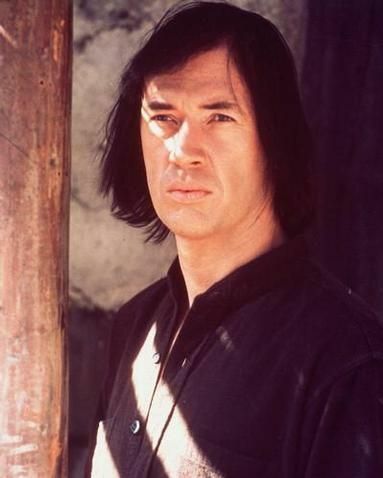 David Carradine is dead, long live David Carradine - LEGEND! Oops. Let's be careful out there!